Getting to Fernie - Travelling to the other side of the world! Here we are in Fernie! It has been a really busy week and we are still settling in. The kids are still waking up at odd hours of the night, like 0215 this morning, but that could be the time zone change or just being a 2 year old. Getting to Fernie was surprisingly easy. The kids were really well behaved and everything worked out great. Our first flight from OR Tambo to Frankfurt was completely full. The kids were very excited and intrigued by everything in the plane. After the meal and a bit of encouragement Sarika fell asleep in Ankie’s arms. Christopher followed a little later, and they both slept about 5 hours. The worst part of the travel was the decent into Frankfurt, Sarika cried all the way down; we practised the motto: “keep calm and carry on”. There was some perks to flying with the kids: Frankfurt had a special line for families, with no queue and about 5 people helping us get through. What a breeze! The 5 hour stopover felt much shorter and before we knew it we were on the plane to Calgary (after boarding first, another perk of flying with kids). The second flight was less than 30% full, so we had a row of 4 seats for each of us. Sarika also slept about 8 out of the 10 hours, with a little prescribed Valegran. 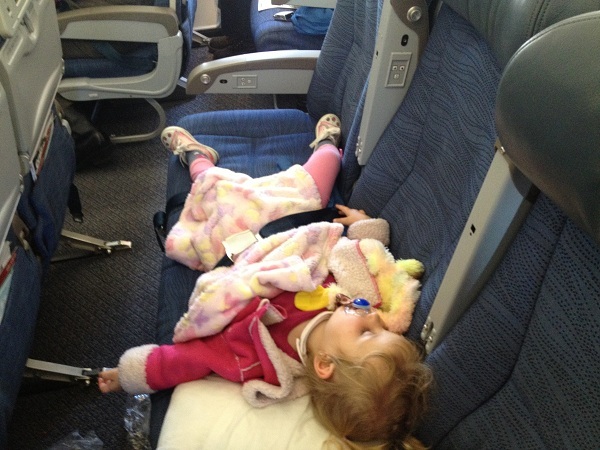 We all got some sleep, stretched out over the seats! It helped a lot having a third pair of hands, ears and eyes on our trip, and I know having Eunice with us (our holiday au pair) is going to be the best idea ever! Getting through immigration in Calgary took a little more time than we had planned and the officer wanted to see all kinds of documents. A family staying for 5 months must look a bit suspicious to them. But after all that we were through and into the rental car on our way to the hotel. Justinus forgot to book a GPS with the car we had to navigate the old fashion way, with a map, luckily that is one of his strong characteristics and I wasn’t worried at all! Once at the hotel the first stop was to get local SIM cards so we could be connected to the world once more! We then went on to Mountain Equipment Co-op to buy some clothes for the kids, by this time they were hit really hard by the Jet lag, they fell asleep in the car. They did not think it was funny when we woke them to fit the clothes. The shoes were fitted in their sleep! So we rather left and went back to the hotel. We got some take-out (as they called it) on the way there, and everybody but Justinus fell asleep in the car. At 10:00 Christopher woke up, wanting to go to the loo, Sarika woke shortly thereafter, wanting to know if she may have a sweetie!!? I was praying that the kids will go back to sleep, as I was very tired myself; at 11:30 the battle was won. At 3:30 I woke up with a thankful heart, with a kid on each side, upside down, their legs all over me, smelly feet in my face, holding their hands while they were still in dreamland. Thankful that the travelling has gone much easier than anticipated, that the kids, especially Christopher was so well behaved on the plane (Sarika was just busy J), that we’ve all made it safe on the other side, that we all kept calm and that everything worked out well. 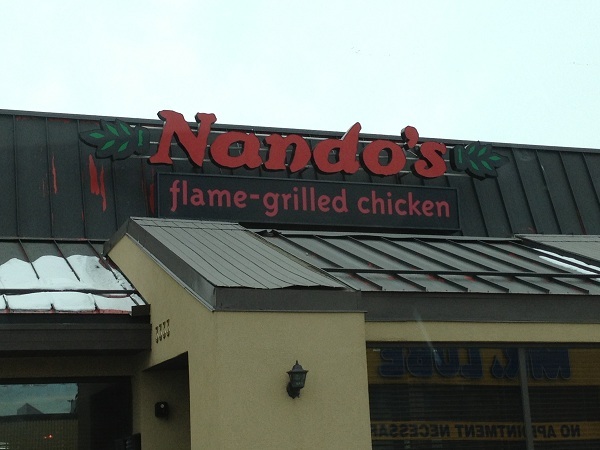 We even found a Nando’s in Calgary! That is our favourite take out back home! Well, with everybody up so early, there was enough time to sort out Justinus’ cell phone issues, exchange clothes at MEC and get something to eat! We actually saw a Nando’s (our favourite) but it wasn’t open yet. We opted for KFC that was close by our pickup to Fernie. Sarika spilled a full glass of apple juice over Eunice, but she handled it quite well! Hal from Fernie Ford picked us up, and we crammed everything in the minivan. I slept for the better part of the drive to Fernie. On our arrival we’ve collected the house keys at Fernie Rentals and were on our way to our new home for the next 5 months. What a relief when we arrived, finally here!! Getting to Fernie was the first part of our epic journey! That box is ticked, now the fun starts! This entry was posted in Fernie, Settling in on 2012/12/02 by Justinus.